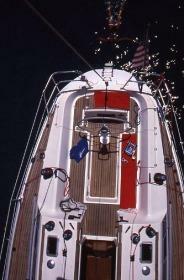 Sun Legende 41: the power Designed by Doug Peterson, the Sun Legende is a first class yacht. 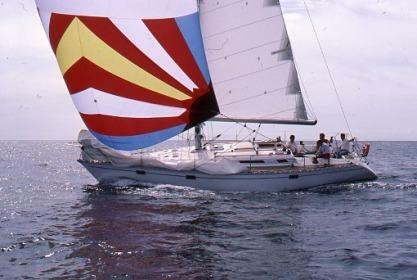 Fast and powerful, the graceful lines of Sun Legende 41 slide effortlessly through the waves: the deck gear, influenced by the constant quest of better performance enhances the steering and handling qualities of the boat, as also does the permanent backstay adjuster, and genoa sheeting cars with instant control from the cockpit. 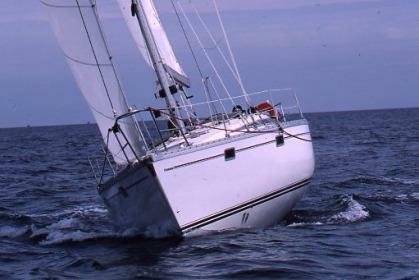 The combination of the best equipment and stainless steel (entirely conceived and treated by Jeanneau) promises strength and durability. 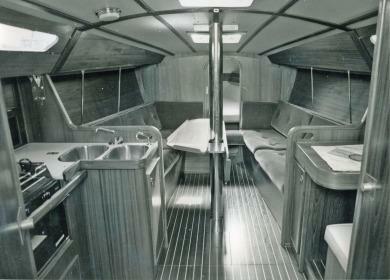 The enormous cockpit, elegancy streamlined in the extension of the coachroof, is entirely battened in teak: the sail lockers are generous, and, as an example of the care taken in the design of Sun Legende 41, there is a special stowage compartment to starboard for the coachroof hatch. 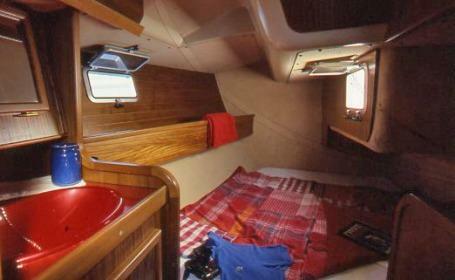 The boat is constructed entirely in handled layers following traditional methods. 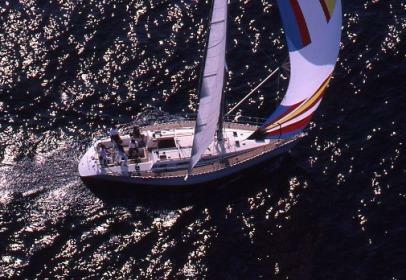 The hull of the Sun Legende 41 uses an exclusive material developed by Jeanneau and Du Pont de Nemours and known as ARAMAT K, of glass fibre / Kevlar. 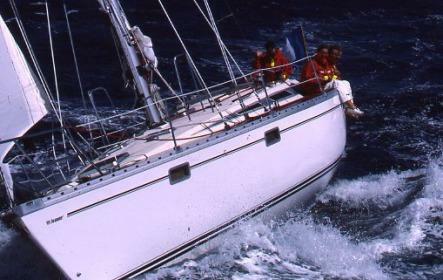 The lead keel will assist the performance to windward of the Sun Legende 41 when racing, as much as the cast iron keel or the lifting keel in fast cruising or in shallow draft. 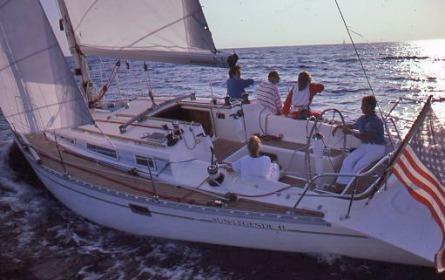 Sun Legend Stately sailing yacht The teak woodwork which is used for the interior finish of Sun Legende 41 attains th elevel of refinement associated with quality products. 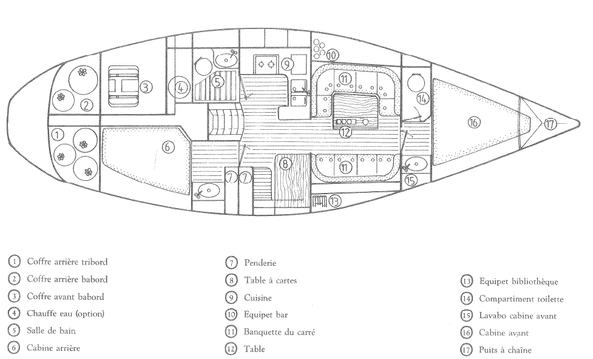 The saloon with its horizontal beaming, is separated from the galley and navigation areas by a beautiful horse-shoe shaped bulkhead. The velvet fabrics in pastel tones complement perfectly the soft glow of the teak. 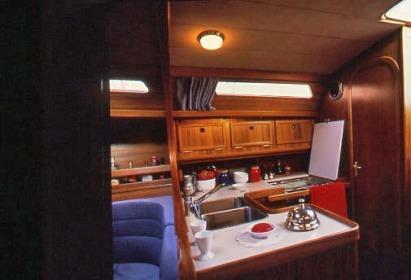 The positioning of the galley and chart table in the widest part of the boat gives them a wonderful sense of space, as has also washroom in the owner's version. 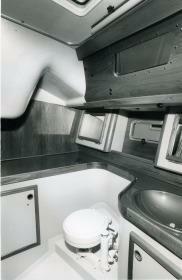 This new concept gives much storage space (large oilskin hanging locker at the foot of the companionway) and many refinements whereby galley with extractor hood; bread storage bin, hot water piping, navigating position with shelved chart storage space, electric panel locker, lectern-type desk. 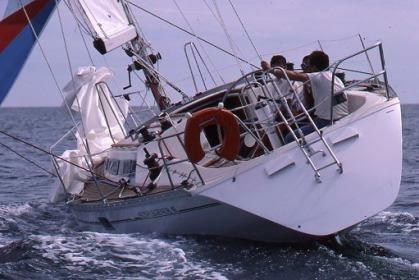 The ventilation system of Sun Legende 41 caters for sailing in every latitude. There are no less than nine portholes; which ideally regulate air circulation, with the addition of three-fitted ventilators. A first glance does not reveal the entire quality of the finish. The interior conception begs to prove itself in sailing, with its condensation-proof finish of the immense washroom, the beautiful solid know-how, gained by years of experience with sailing cruisers. 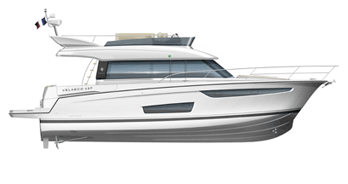 There is a choice of two lay-out arrangements for Sun Legende 41: owner's version with three cabins and two washrooms, or team version with four cabins and one washroom.